After Kramer auditions for the role of “Kramer” in the pilot episode of Jerry, he is overcome with intestinal affliction and goes off in desperate search of a bathroom. However, he is unable to find an available restroom as all of the ones at the NBC studios are occupied, and he is turned away by other business establishments he tries because he is not a customer. Can establishments open to the public turn away people wishing to use their bathrooms because they aren’t customers? Should NBC have had more restrooms at their office? Businesses are within their legal rights to have a “customer only” bathroom policy. Meaning, businesses are under no legal obligation to provide bathroom access to the public at large. They are allowed to limit access to their bathrooms to only those that are customers. In this case then, Kramer is out of luck. Although he is clearly percolating, restaurants and businesses are under no legal obligation to provide him with access to use their facilities. As for whether NBC had enough toilets at their office, the Occupational Safety and Health Administration, an agency under the US Department of Labor, regulates the number of toilets that employers are obligated by law to provide for their employees. Businesses with less than 15 employees are only obligated to provide 1 toilet, but those employing more than 150 people are obligated to insert at least 6 apparatuses in their facilities. Any business that does not abide by these regulations is going to have a big problem. 1 Additional toilet is mandated for every additional 40 workers beyond 150 employees. Here, we don’t really know how many employees NBC has or how many toilets they have provided for their employees. While the episode is sparse on how many toilets there are at the NBC studios, we do know that Kramer does enter the bathroom before being told “sorry buddy, full house,” indicating that there are multiple toilets in that bathroom. Therefore, while we can’t say for sure, it’s pretty likely that NBC has fulfilled it’s OSHA obligation regarding the number of regulated toilets. As an additional note, New York City requires at least one toilet for any restaurant or food establishment that has 20 or more seats. Kramer would have had more luck finding a toilet if New York City had more public restrooms. While there are free public bathrooms in New York City, they are typically isolated to locations inside public parks. Ironically though, Kramer actually runs through a park, presumably Central Park, as he searches for a bathroom, and there are public restrooms in the park for him to get all wet and wild! Whether they were open at the time of “The Pilot,” though, is unclear. Although pay-toilets were banned in New York in the 1970’s thanks to the efforts of the Committee to End Pay Toilets in America, for reasons unclear to this writer, New York City ordered 20 pay toilets in 2008 to be placed around the city. But installation of these facilities has been, for lack of a better phrase, clogged for a decade. While it was perfectly legal for Kramer to be turned away by private businesses from using their bathrooms, New York, among other States, has passed legislation that allows for people suffering from chronic intestinal illnesses, like Crohn’s diseases, access to “employee only” bathrooms. These Restroom Access Acts, or “Ally’s Law,” gives those suffering from Irritable Bowl Syndrome the right to use an “employee only” bathroom even though other customers or patrons of the business are not permitted to use the facility. While this legislation would not have helped Kramer, it is important for those who suffer from IBS. 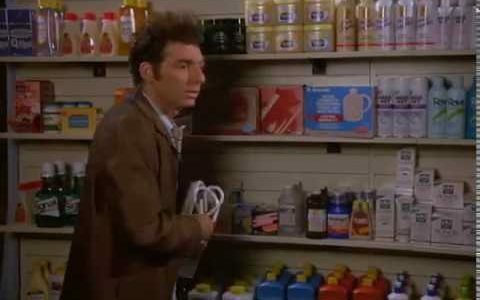 Needless to say, Kramer found himself in a very unsettling situation. But it doesn’t seem like either NBC or any of the businesses that turned him away actually did anything wrong. Private businesses are not obligated (except when Ally’s Law would apply) to provide bathroom access to people who are not employees or customers. Even in an emergency situation, this law still requires a person to show a special identification card for them to be protected by the law. Will there ever be enough peristalsis to push New York City forward into creating more accessible public restrooms? All we can say is that the anticipation is killing us.